Brite-Dock - Express Corporate - Promotional Products - Delivered Fast! The brand new Brite-Dock is a reveloution in desk-top promotions. Your customers can keep their mobile phone handy at all times, right next to your brand and message! 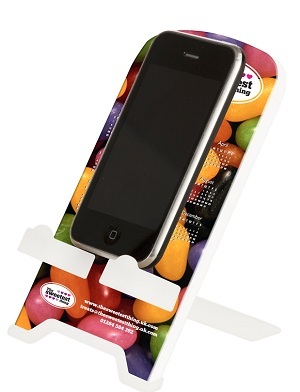 The Brite-Dock will carry your message across the whole front area of the phone stand with stunning colour reproduction. Plus print to the reverse at no extra cost! The Brite-Dock comes with two soft-feel, non-slip feet which can be removed and attached to the back of the Brite-Dock for compact storage or mailings. Supplied in a presentation box. Both models are extremely hardwearing and eco-friendly, with the Tyre Brite-Dock containing recycled rubber tyres.